Let’s say you have calculated a number (percentage change for ex.) in cell F4. Now change the cell font to wingdings 3. This will change the values p & q to up & down arrow symbols. Change font color to green. Set up a rule to color the cell value in red when it is p.
If you wish to see the % value, keep the adjacent cell (F4), else hide it. Conditional formatting is one of my most favorite areas of Excel. It has a ton of potential and offers a lot of creative freedom. Check out below tutorials to power up your conditional formatting mojo. How would you turn the arrow green? Would you use the above approach or something else? Please share your ideas in the comments section. Why does the example look like the arrow and -16% are in the same cell? Following the instructions makes two different cell. I noticed the same thing. I can't get the arrow and the -16% in the same cell by following the instructions. What is the trick to make this work within the same cell as seen in the gif? Hi folks... they are indeed 2 cells. I just applied one border around both to make them look like one cell. Instead of using "p" and "q", I prefer CHAR(199) and CHAR(200) of the Wingdings 3 font. Now I only use Conditional Formatting with the Icon Sets. Just edit the formatting rules, choose the appropriate icons (or Reverse Icon Order) and you are good to go. I'm mostly a silent follower and an avid fan of your website. I found another way to change the icon as well. But, the green arrow still goes up. Trick was to make the down arrow be green. My guess is Manish have not click the OK button when he captured the screenshot 🙂 That is why the arrows are not updated. I am also using the same method for the conditional formatting. Manish's reply is absolutely correct. There is no need for a workaround. Your problem is probably that you don't change the type in CF from percent to number. Thanks for the suggestion Manish. Unfortunately, this method only changes the icon order, but wont get you the behavior mentioned in the post. See this image to know the difference. The CF with Icons works perfectly for me. Am I missing something? There is no need for a workaround. 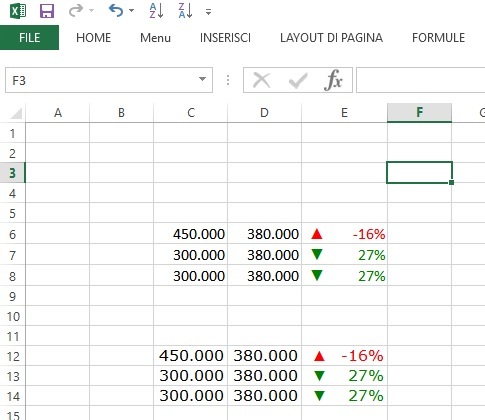 Excel handles both, color and arrow direction. I agree with you the behavior for negative numbers or percentage needs to be green down arrow and for positive up arrow, can we apply it on single cell of a pivot. The same result can be achieved with custom format without a particular font Arial Verdana Etc. Thanks for this article. This is one of the greatest/funniest tricks I've seen. Finally, a use for the wingdings font! This is one of the greatest/funniest tricks I've seen. I l?ve playing with number formatting and so when I saw your trick(s), I was in heaven! Simple tutorial yet I cannot get this to work in Excel 2013. After I change the font type to "Wingdings 3", I get no arrow. Can anyone help me out? Very simple and usefull, thanks.